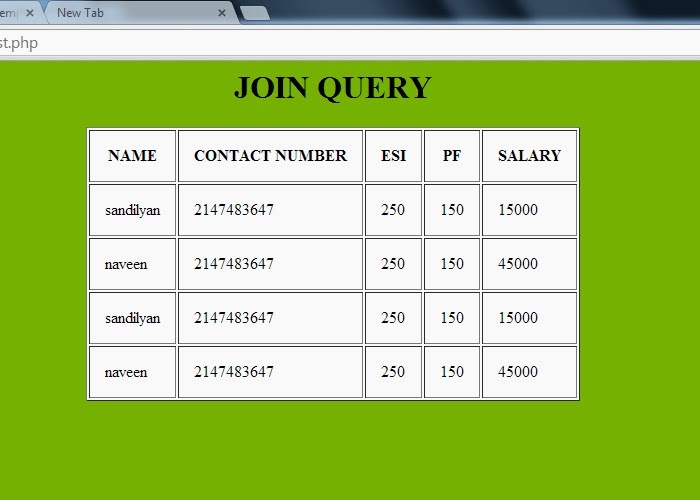 In this post i am explain about to display the two mysql table data in single table using mysql inner join query . The two tables are personalinfo, salaryinfo in that two tables i am using common id is called as a empid using this i am selected two different table datas in single view. I am displaying the data name, contactnumber from personallinfo table and then esi, pf, salary from salaryinfo table and then i am displaying in a single table using empid as a common id.